In the 1970’s, a typical suburban youth wouldn’t conceive of declaring a new art movement. A more natural mode of rebellion would be to start a band. At Prism Gallery in West Hollywood, Mike Kelley curates the first retrospective of work by the original artists in Destroy All Monsters. “Return of The Repressed: Destroy All Monsters, 1973-1977,” presents Mike Kelley, Cary Loren, Niagara and Jim Shaw as members of an experimental band and art collective. 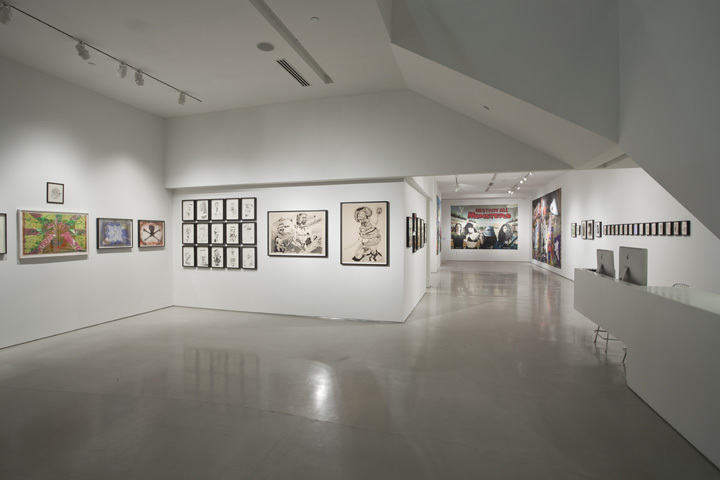 This expansive exhibition highlights a rich archive of prints, drawing and photography, including several mural-sized paintings, which commemorate influential figures in their collaborations. The collection of ephemera conjures a vision of the quartet tinkering in the basement of an old Victorian. They’re making lewd noises while inventing mutations of pornographic models and comic book characters. In 1970’s Ann Arbor, Michigan, the four artists manipulated tropes of a band to unleash a ritualistic, “combination of accident, fumes and frenzy.” These are words Kelley uses to describe Jim Shaw’s method of spray painting on collage. In the spirit of Dada, DAM employed found material to disassemble pop-culture, pre-existing social structures and contemporary art critique. For example, in a performance project called Futurist Ballet, Jim Shaw created flyers advertising fake lectures, which were posted around the University of Michigan campus. When a few colleagues would get duped into attending, “D.W. Janson on Zoroastrian Symbolism in Duchamp’s Large Glass,” they would be confronted with a loosely planned, guerilla performance. Destroy All Monsters did not ignore the boundaries of conceptual art or music genres, but it reacted to them. The structure of a band also gave its members a contextual grounding for their individual practices. There is no soundtrack in the gallery to distract from the visual rhythm created by the cacophony of images. 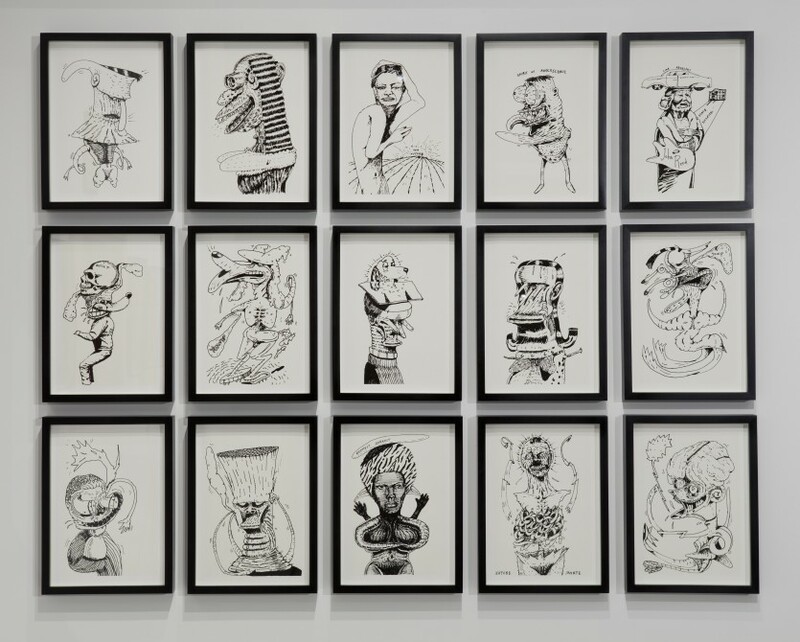 This two-story exhibit displays Xerox collages, pages from zines, photography and drawings, vaguely divided into quadrants dedicated to each artist. The quantity of archived ephemera produced from 1973-1977 is oddly disproportionate to their limited notoriety as a musical group. Kelley redefines DAM, instructing us to view the experiment as a visual art collaboration, rather than as a band. The show is less like a retrospective than the long-delayed realization of a youthful ideal, the mature culmination of the group’s vision. Today, music and concepts of memory continue to play a key role in Mike Kelley’s practice. He produces soundtracks for many of his video installations, including, Exploded Fortress of Solitude, a solo exhibition at Gagosian earlier this year. 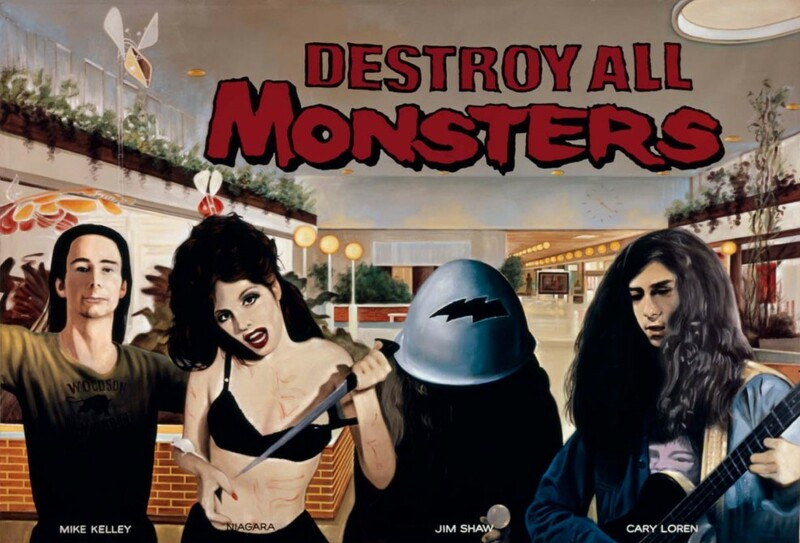 Destroy All Monsters developed Mike Kelley, Cary Loren, Niagara and Jim Shaw as artists by allowing them the freedom to react with messy spontaneity to the changes in their world. A Kurt Vonnegut quote comes to mind: “It strikes me as gruesome and comical that in our culture we have an expectation that man can always solve his problems. This is so untrue that it makes me want to cry— or laugh.” DAM gave these artists permission to do both. A 312 page catalogue from, Return of The Repressed: Destroy All Monsters, 1973-1977, is available at Prism Gallery.